one of the World's finest Armies and adapted it to the game we play. the game allows us to use. the day we enjoy playing with the friends we have made. right attitude is most important to us. enough people around during the week to also hold impromptu games. increase immersion and realism. Chief amongst these are ACE2 and ACRE. So a willingness to use these community made mods is necessary. head on over to www.16AA.net or read on for more information. two full Sections along with HQ and Support, as well as a Flight. find a top heavy gathering of Generals in our group. Section Leaders or Section 2ICs within the group. We are however keenly aware that this is a game and we are "fighting"
It's a game after all and we're here to have fun. carrying out mounted patrols in Jackals or Landrovers. Enjoy carrying a significant portion of the Section's firepower? the Section's Combat Lifesaver could put you on that path. provide the right amount of challenge and fun. that they will make it to their Objectives safely. feel free to hop on our TS Server if you'd like more information. see the details, feel free to head on over to the forums: here. release, but hope to have this done soon! to dislodge a well equipped military regime. our Home Rotation for two weeks. We're in the process of finalizing our third private server at the moment. playing without Mods - though we are open for suggestion on that. We are always on the look out for new members to strengthen our unit. and post up your application! recently with new Lance Corporals being assigned to both 1 and 2 Section. 3rd Section and a Fire Support Group to fill out the Platoon. 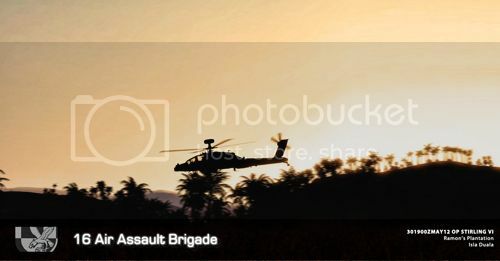 role to our Air Assault Infantry. ready to share with the community. you'll then be transferred across. whereby a handful of =UKTF= members took up the role of Insurgents hiding within a city. 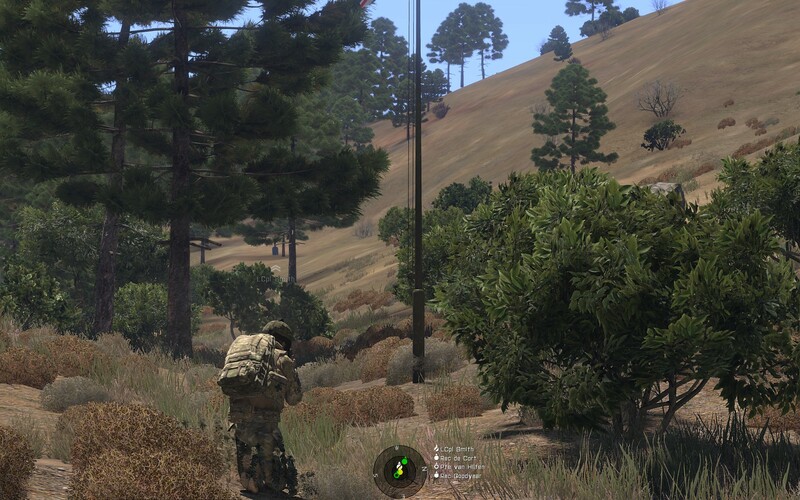 The Patrol quickly turned deadly when an RPG team opened fire, fatally wounding one of ours. The situation intensified after that with the Patrol on edge and on guard. which was later also killed. however and the recovery of their bodies only dampened that slightly. our a new campaign; Operation MYRIAD, which is set to kick off on Sunday! head on over to www.16aa.net! I'm pleased to announce that we've had exceptional growth in the last week. It is truly awesome to be a part of the 16AA. From real life military members to real life helo pilots and everything in between to the implementation of the practices found in these fraternities; 16AA is probably one of the closest one can get to milsim in a game. We do not however stop there, we are constantly looking for new ways to improve and this is the lifeblood of the 16AA. If you are looking for a true milsim unit with the appropriate maturity levels to go with it then you've found the right unit. 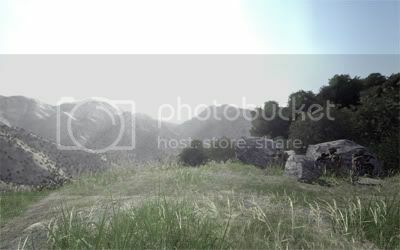 Please visit our website here and fill out an enlistment form found in our forums. movement through back alleys and buildings to reach the compound. and the sound of a heavy fire fight underlined the sense of impending disaster. that was armed posed a threat. and one of the civilians, AP Reporter John Hamilton, had already been killed by a grenade. Guards as they scrambled to their vehicles to retreat. back gardens, Section rolling over Section until we reached the Landing Zone. 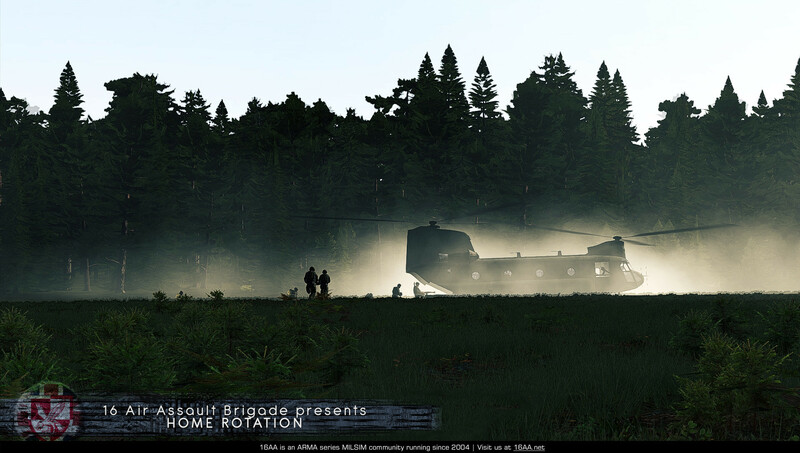 Zone and the Platoon and both civilians (one T4) extracted safely back to base. increasing it's knowledge on the area and the main players of the region. Syriani AKA MAARAS and dissambling his network before it can build momentum. Operations and for the midweek Training Sessions. are then tested in a final two hour exercise. have already been promoted to Section 2ICs. been behind most of the events faced in Operation MYRIAD. While the MSO operation didn't work (when we had sixty+ people on the server it seemed to have a fit) we haven't given up on it and we are, in conjunction with Volcbat, updating the system (based on the latest MSO updates) to allow us to continue with the op. While that is in progress, we've dived into a new operation called "Operation Werewolf" based on the Namalsk map. 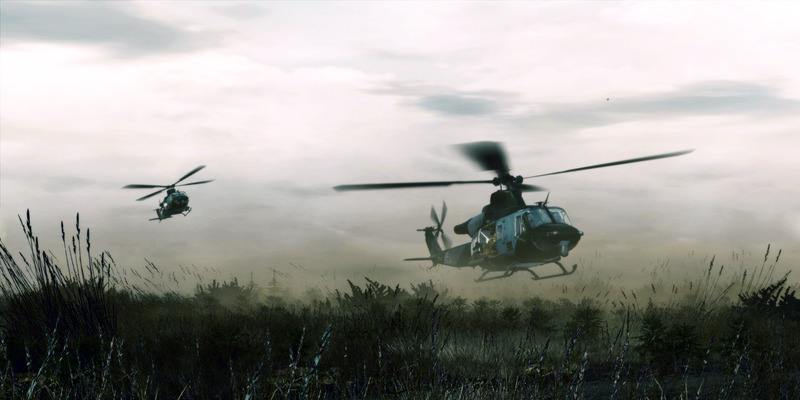 The operation has been designed as a set of Air Assault missions using all of the infantry and flight training and experience that we've gained over the past few months in a gritty and realistic setting. 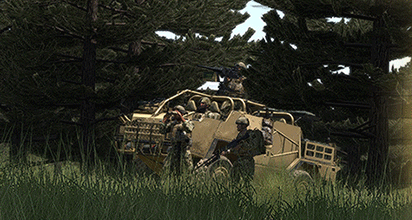 Tonight will the first of eight parts and we have 35 people signed up for the kickoff tonight - meaning we'll have a full infantry platoon deployed on the ground with two airframes up from the AAC for Insertion, CAS and CASEVACs as needed. There are large group level operations each Wednesday and Sunday which normally see 30+ people attending. If the above looks like something you'd be interested in please do check out the new "Joining the 16AA" section on our website. Operation Werewolf has been progressing very well with us just completing our fourth part (to secure a dam on the map of Namalsk). We have been deploying a full platoon to the field each week (three full sections, an HQ/WSG group and 1FLT (normally two fully manned helo's)) for the operations and moving as a real platoon would in the field. After much hype and anticipation the Joint Operation with VOLCBAT sadly failed to get off the ground due to technical problems. In the wake of what was to be Operation MARQUIS, the 16AA are now preparing to deploy to Lingor Island on a new 3 month Operation: ORYX. 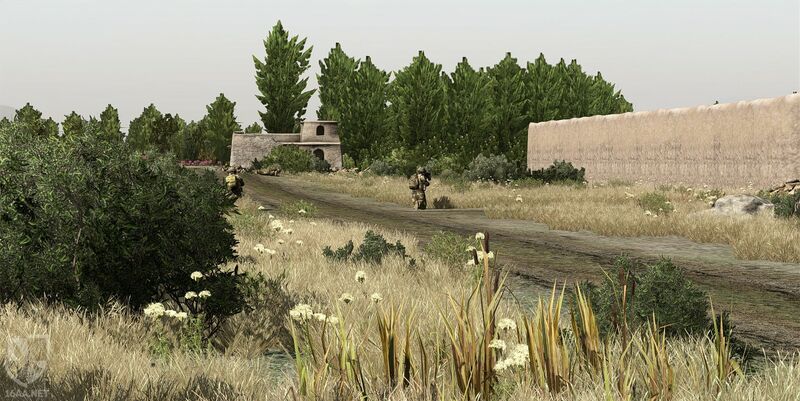 In the short period following the termination of Operation MARQUIS, the 16AA was tasked with a last-minute deployment to the Takistani theatre as part of a NATO led surge to regain control of key areas of Takistanâ€™s Central Province. 1Plt 16AA + 1Flt rotary assets were tasked as Coy QRF operating from FOB HUTSON to continue efforts to re-establish NATO control over the SAGRAM-ZAVARAK-KARACHINAR area of Takistanâ€™s Central Province. "Gentlemen, the citizens of Lingor are the victims of ethnic tensions that threaten to destabilise their entire island. Political leaders on all sides have made provocative moves and educated poor judgement and care for the civilian poopulation. The Brigade is being sent to guard the civilian populace against violence from the separatist militias. We will act alongside the Republican Army and their police forces, to help them curb increasing levels of violence. The political dimensions of operating in a former British Overseas Territory should not be overlooked - whilst we will be deploying at the direct request of the Lingorian Government of President Douglas there will be some who will view our activities through a different lens. I expect all Officers and Men of the Brigage to act with the uptmost dignity, respect and neutrality at all times - we cannot afford to be seen to take sides in this ongoing conflict. Ethnic divides can not be erased by military conquest; every soldier should therefore realise that we are being deployed to accommodate for peaceful talks between the parties. To this end, the most violent extremists must be stopped dead in their tracks. I encourage all Officers and NCOâ€™s to familiarise themselves with the details of the island: Its ethnicities and cultures, its tropical terrain and the difficulties that the Republican Army have had, and the lessons they've learned and to standby to receive further ISTARS data and Intelligence as it becomes available." Following the intense campaigning as part of the UKJTF(L) Operation ORYX A Coy were rotated out of theatre to undertake training activities ahead of the forthcoming deployment to Takistan as part of the ISAF Operation LINSTOCK. The LONGSTONE series of training and exercises were held at the Copehill Down MoD Training Facility on Salisbury Plain and focused on refreshing key skills and familiarisation with newly issued equipment, including the THOR III C-IED jammer and the Bulldog AFV, which will be essential to the forthcoming operation. Each Section were made to rotate through three thirty minute 'stands' with a set instructor and designated learning objectives for each stand followed by a final thirty minute exercise in order to bring the learning together. Aim: Instruction on Section level urban movement drills, covering arcs, calling openings, obstacle crossing. Method: Section level instruction and practical demonstration. Aim: To apply principles of OBUA movement to REEF drills. To practice REEF in urban environment. Equipment: BFA/Flashbangs, all to have ACE grenade throw configured. Method: Section level instruction and practical demonstration to focus on: windows and doors, cutting the cake, breach and clear, use of flashbangs and fragmentation grenades, co-ordinating within structures. Emphasis on controlled aggression, clear communication, rapid movement and individual battle skills. Method: each Section will take turns to divide into two OPFOR fireteams and occupy two separate buildings. Remaining Sections will conduct two separate simulated assault, breach and clear operations. DISTAFF will be on hand to nominate casualties (who will also be instructed to self nominate by 'surrendering') and call ENDEX as required. Debrief for each iteration to include both sides. Exercise LONGSTONE II took place on 162000ZNOV11 at CHD Military Training Facility. LONGSTONE II focused on C-IED training including Force Protection ECM/EW using the THOR III DTMF (Dual-Tone Multi-Frequency) jamming device. Participants gained an overview of C-IED SOPs including Confirm; Clear; Call; Cordon; Control. 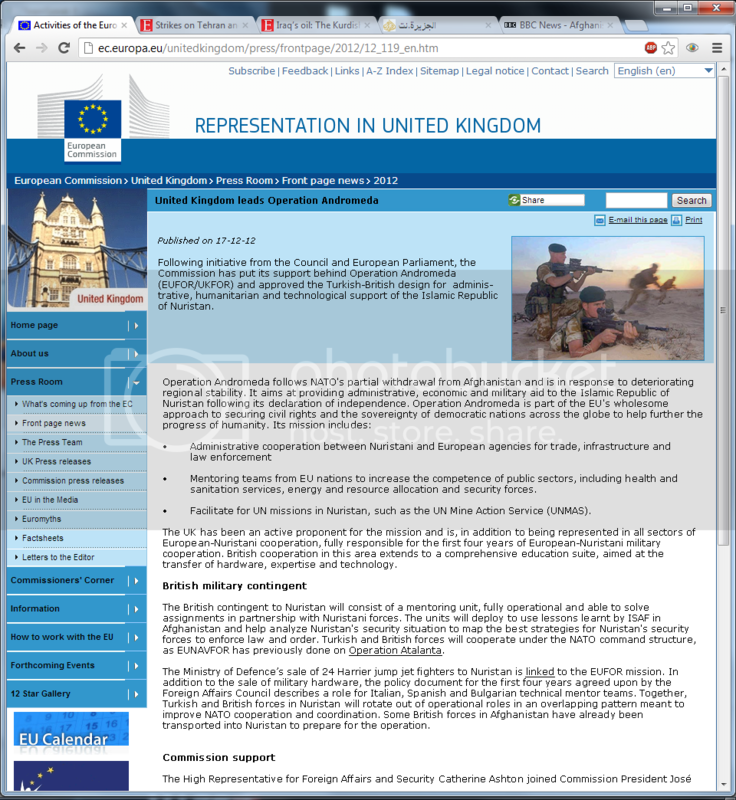 With a focus on Render Safe Procedures (RSP) for UXO including BIP (Blow in Place) training. There was also the opportunity to reinforce recent learning on Operations in Built Up Areas (OBUA) core skills, followed by a platoon level live-fire exercise. Method: Section level instruction; practical demonstration and Section level exercise. Equipment: Standard, all to have ACE grenade throw configured. Method: Section level instruction and practical demonstration to focus on: air assault landing in the urban environment (including but not limited to FRIES) and assault on target building(s). Aim: Practice of OBUA/FISH drills with live ammunition and static targets. Method: as per map detail. 1Plt will conduct simulated live-fire urban assault from E of Copehill Down Village. Longstone III forcused on Convoy training ahead of the 16AA's deployment to Takistan for Operation LINSTOCK. Method: Platoon level instruction; practical demonstration and Platoon level exercise. 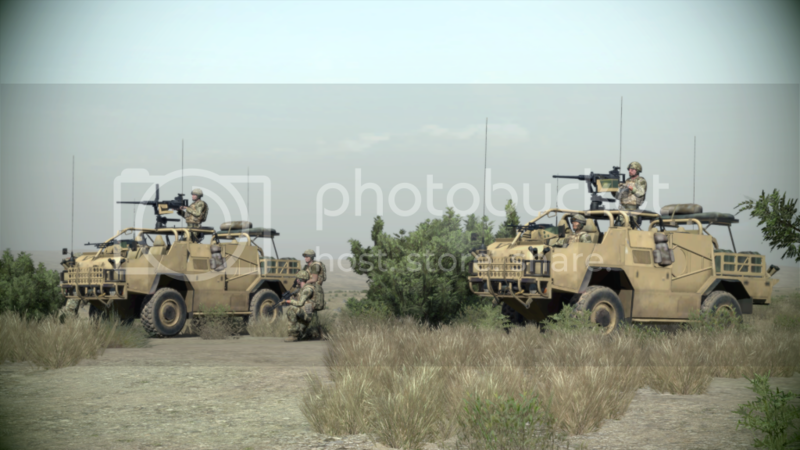 Aim: Instruction on Platoon level Combined Convoy/C-IED procedures. Aim: Practice of Convoy Operations/OBUA/FISH drills with live ammunition and static targets. Method: as per map detail. 1Plt will conduct simulated convoy/C-IED exercise from W of Copehill Down Village. The 16AA was warmly welcomed to the mountains of Clafghan, by a 10 minute flight in 2 Chinooks with Apache support. The beautifull terrain and epic vistas were cut short with the realisation of how remote and hostile the picturesque country really is. PB MIKE, 16AA's home for the coming months, is a tiny Patrol Base near the eerily quiet town of Al Jebel in the deep North Eastern Alkhemora Valley. After a brief respite to assess the PB, 1PLT was tasked with a simple foot-patrol to the SE. 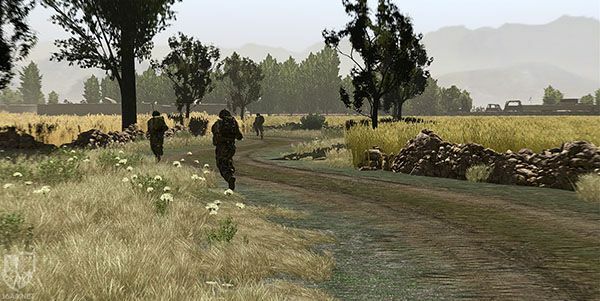 The Sections stepped off in good spirits, fresh and ready to give the local insurgency hell, unknowningly walking into, what could be, the most hostile enviroment 16AA has faced yet. It slowly dawned on Section IC's, and HQ, the sheer scale of the task before them. What looked like simple patrol routes, were complex mazes of killzones, rolling valleys and deadground on all sides. Foilage was high whilst Cover was sparse and the enemy decided to welcome the Platoon in text book style. 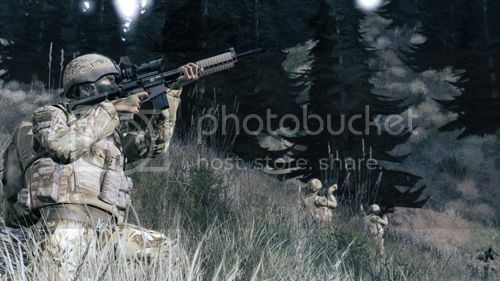 Snap Ambush from strong cover and concealment from multiple angles with extremely accurate, and heavy, suppresive fire causing instant casualties for the unlucky Section involved. 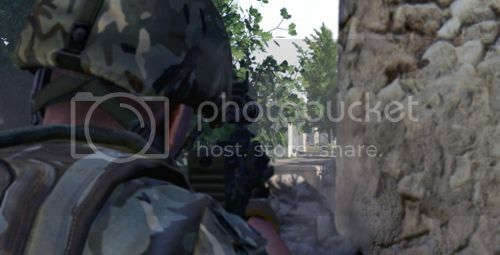 Above:Footage released from a headcam in A/1/1. Warning contains graphic images. Note that blue-on-blue was called, but in discussion afterward it was deemed that it was not the case. This was just the tip of the iceberg for the 16AA, the rest of the patrol was a baptism of fire that resulted in intense fighting between both sides. The Patrol was visible to, and from, PB MIKE I at all times yet the feeling of being seperated from the world and any safety was palpable. On return to PB MIKE I the members reported a feeling of weight being taken off their shoulders as they walked behind the relative safety of the Hesko Barriers keeping the world away. Clafghan as a whole will be a serious challenge for 16AA yet we will face it with open arms and bayonets fixed. Prepare for information about Chalice II as it becomes available, and remember that you can find all information on previous campaigns, and recruitment, at www.16aa.net. The 16AA has since the last update to this thread participated in several major conflicts throughout the world. Of particular importance is its growth: The 16AA now encompasses two infantry platoons, one fire support group (FSG) and a combined TACP/1 Flight element, producing a mean turnout per bi-weekly operation of ~60 soldiers. Completely new is the interfacing with Flight Simulator 2009 and FSX through RAF No.2 Group. The 16AA continues to aspire to be the ultimate British milsim unit. The bulk of this update is about our most recent operations. Our operations usually last for 9-12 missions, each three hours long, Wednesdays and Sundays, at 2000 Zulu (wintertime) / 1900 Zulu (summertime). After each operation we go home for a training rotation of 2-4 ops where we hone our skills in advance of the next operation. 16 Air Assault Brigade deploy with elements of the USMC to Isla Duala in an effort to expel Government of Molatia forces from the island and restore regional stability. 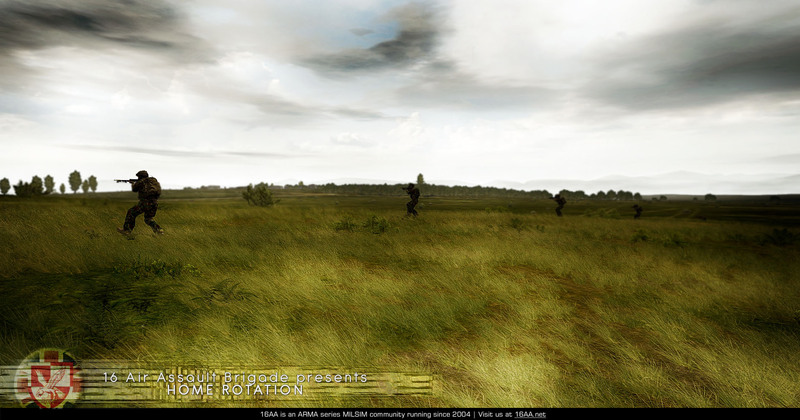 An intensive campaign where the Molatian military is able to throw its full weight against the 16AA. The 16AA is forced to counter mines and Hinds and armoured threats. Following the rebellion in Syria and attacks on Turkish settlements, a US-lead coalition consisting of Britain and Turkey assault key areas of Syria. The coalition acts under a UN resolution to bring conflict to a still, and to seize and return all military hardware that could destabilize the region if not managed by a unified military. Due to the British proximity to the Syrian island of Capraia, the 16AA is immediately thrown into an air-assault from RAF Akrotiri. After a long ferry flight and massive airstrikes on the island's air defenses, the 16AA battled through the defenses of a conventional army made ever more desperate with each retreating footstep. In the end, the power vacuum threatened to give rise to sectarian violence and has forced the British to leave a contingent on the island. Resident mission- and addonmaker Glowbal brought the Paramo campaign where the 16AA deploys to Sangin, Afghanistan. This proves an immersive and challenging operation as the 16AA interacts with the local population to learn their needs and attitudes. The IED threat is continuous and keeps all on their toes - in particular pointmen that carry the detector equipment. Long patrols force the sections to keep a single file - no man to step in new footsteps, lest they risk injury. Strict ROEs and primitive platoon houses contribute to the physical as well as mental challenge. The brigade attempts to bring stability to the region by meeting with local elders in Shuras and combatting militants, but is ultimately forced further north to counter a dramatic offensive by the insurgent enemy. Our current operation sees the 16AA as part of a unilateral British endeavour to keep its position on the Namalsk island in the Barents Sea. 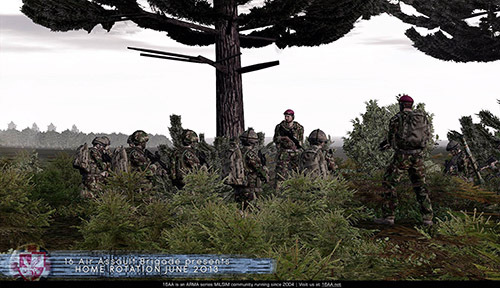 Under threat from Russian claims of sovereignty over Namalsk, the small British garrison is strengthened by the 16AA which is to act against militant Russian nationalists on the island. The initial assessment that Russia would not let matters escalate has proven false: Following the Royal Navy's HMS Triumph's torpedoing of two Russian freight ships and a destroyer, the Russian air force has struck against British naval forces in the area. 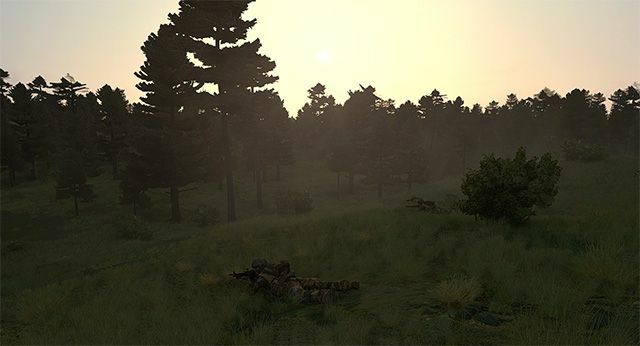 The situation remains highly volatile as the 16AA is cut off from its supply lines and reports indicate elements of the Russian 234 Guards Airborne Regiment will deploy to assault and seize the Namalsk Archipelago. 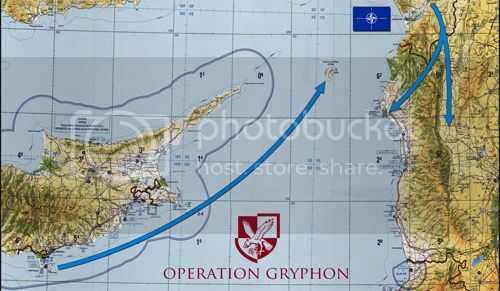 1 Flight armed Gryphons land at FOB Tara. A 2 Platoon infantry section aboard a Jackal. 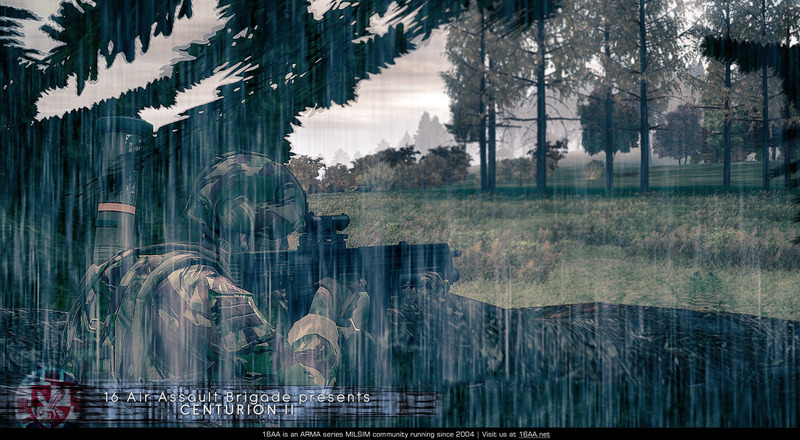 A designated marksman covers his sector. 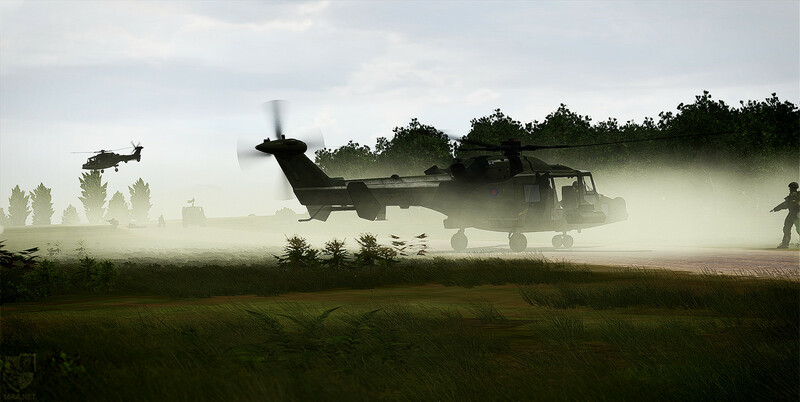 This group is for members of the unit who would like to have their flightsimming assume an air of British milsim. Routes and planes reflect on our operations and are sometimes integrated into the narrative of our operations. The loss of an AH-1 Apache airframe in Afghanistan, for instance, warrants an RAF C-17 Globemaster flight from RAF Brize Norton to RAF Akrotiri and from Akrotiri to Bagram, then home again. Less time consuming are the diplomatic couriers (BAe 146-100/200) or AO-internal freight flights (C-130). Participation in RAF No.2 Group is on a casual basis. We hope to see you visit our page, browse our gallery and maybe check out one of the many videos that are posted after each operation. If you can meet our requirements and would like to join, feel free to submit an application! The 16AA has remained busy in Arma 2, despite many unofficial hours on Arma 3. We look forward to what A3 will be! The 16AA stands out the MoD's most flexible and able unit, deploying to theatres of conflict to project power or keep the peace. 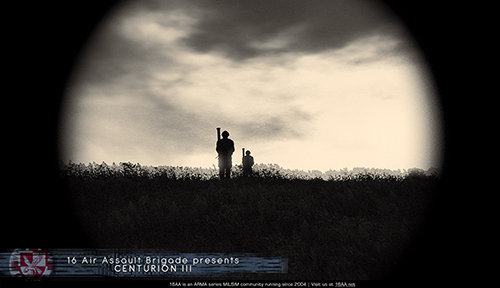 Since the last update, the 16AA has grown a little further, specialized some more, and attempted to move the boundaries of MilSim to the very limit of what Arma 2 can offer. 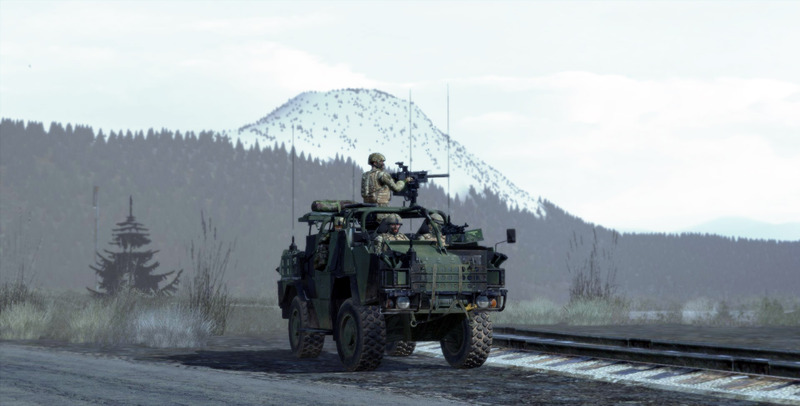 The creation of the Medical Emergency Response Team has been one part in institutionalizing a better approach to handling casualties in Arma 2, based on the knowledge of those with us who've served and treated. 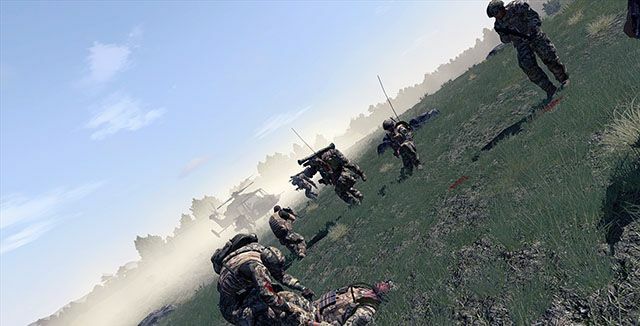 Instrumental to approach has been the Combat Medical System addon, partly developed in-house. The 16AA deploys on campaigns that last around 2-3 months, operations separated by valuable training at the Bergen-Hohne MTA. These have been Op PALLISER, Op BRIGHT DAWN, Op ANDROMEDA and, currently ongoing, Op BELLEROPHON. Since our operation times are every Wednesday and Sunday, at 2000z (wintertime) / 1900z (summertime), each lasting for three hours, most of our campaigns are 9 to 12 missions long. Following is a selection of pictures from some of the operations mentioned above. 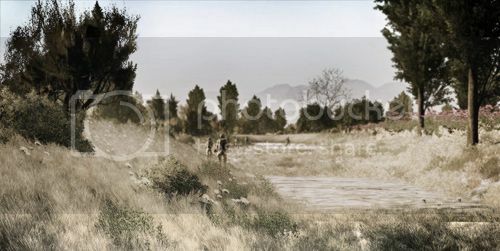 The 16AA deployed as part of a NATO-lead surge in the Takistani theatre's central province. The presence of enemy strongholds and heavier weapons suggested a transition of local Takiban elements from loosely organized insurgents, into a force able to retain territory and upset the fragile regional security and governance. 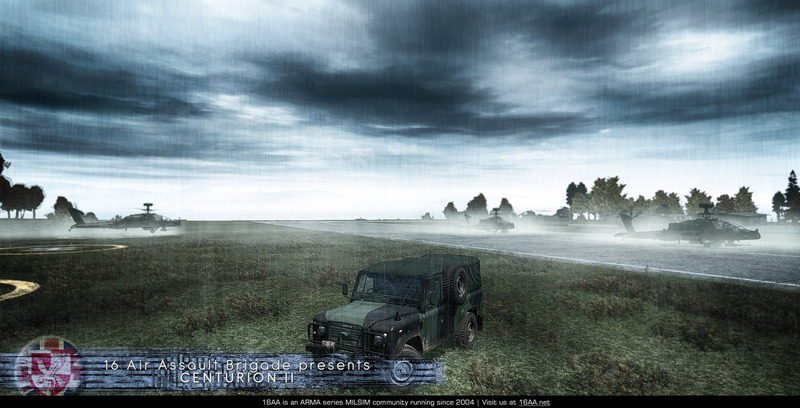 The 16AA deploys a QRF to the politically unstable Isla del Fuego, and island in the tropics. A Company is inserted via the HMS Illustrious in response to a full-scale rebellion that threatens the security of the local civilian population. Among the strategic locations held by the enemy was the island's sole power plant. Following the autonomy of the Islamic Republic of Nuristan from Afghanistan, the EU and Turkey invest in bringing the infant state nation-building support. The 16AA deploys as part of a mentoring team to help stabilize the Ovallestan valley. After weeks of deployment dealing with relatively little unrest, significant elements of the Nuristani Army and Air Force rebel against the central government. A Company's posting is directly between the rebel forces and the central government, forcing it to fight a delaying action until the rebel forces' resolve can be weakened. It is indicative of the unit's size when three Chinooks are necessary to bring in the Coy. 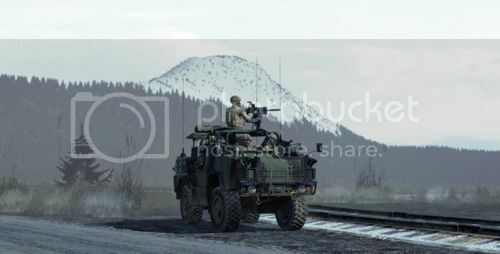 1 Platoon moving through the Ovallestan valley, cradled by majestic mountains. 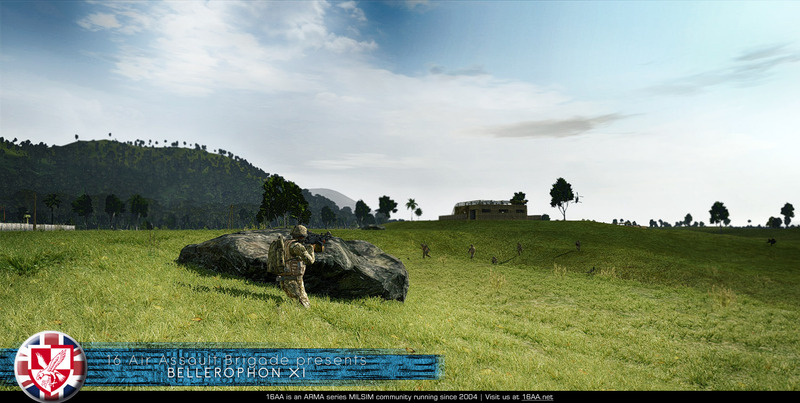 An AAC Wildcat lands close to the action, after A Coy has engaged the rebel army's positions in the district capital. 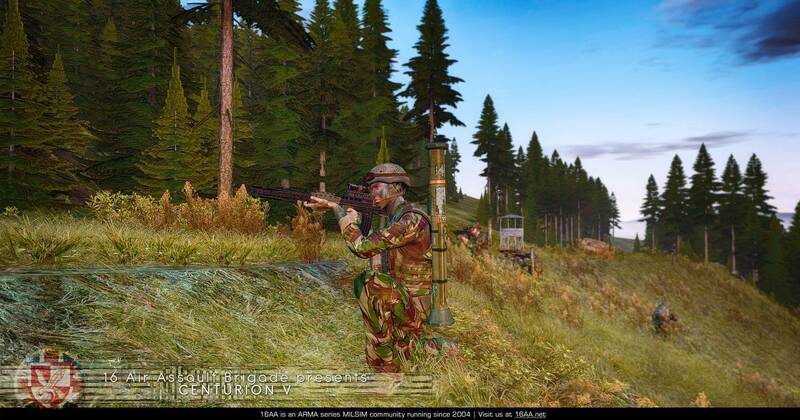 The 16AA is currently deployed to Chernarus. After an unexpected assault by Sahrani forces took place during a British exercise on Chernarus, A Company was cut off from its operating base. 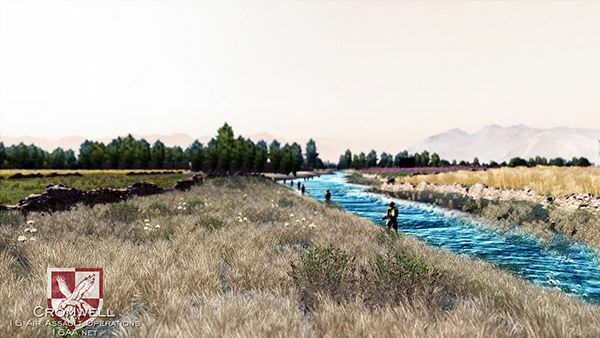 Consequently, the individual sections, each separated as part of the original exercise, had to travel on foot to rendezvous and bring the company back to strength in the field. The current intent is for the company to maneuver through the enemy held territories to retain its combat effectiveness, and eject the enemy from the airbase so as to facilitate airborne support. Until then, the company is for all intents and purposes stranded with only occasional support from flight elements. Training is central to the 16AA, and Home Rotations may last for two to three weeks between operations. These trainings are spent honing basic core skills in addition to preparing for new tasks and, as with CMS, new functionality. Ahead of Op PARAMO and Op ANDROMEDA, for instance, we would train closely on Counter-IED drills and on Glowbal's Advanced Interaction Module, which brought interaction with civilians to a new and more realistic level than previously possible. 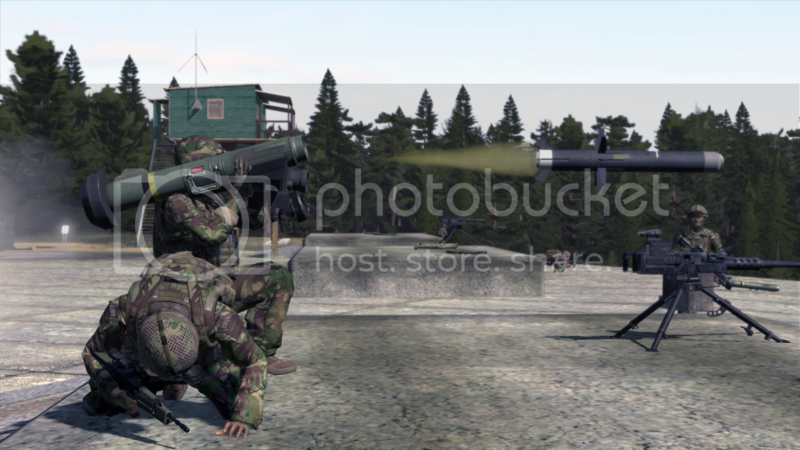 The Fire Support Group deals with a large amount of sophisticated and lethal weaponry, here the Javelin. 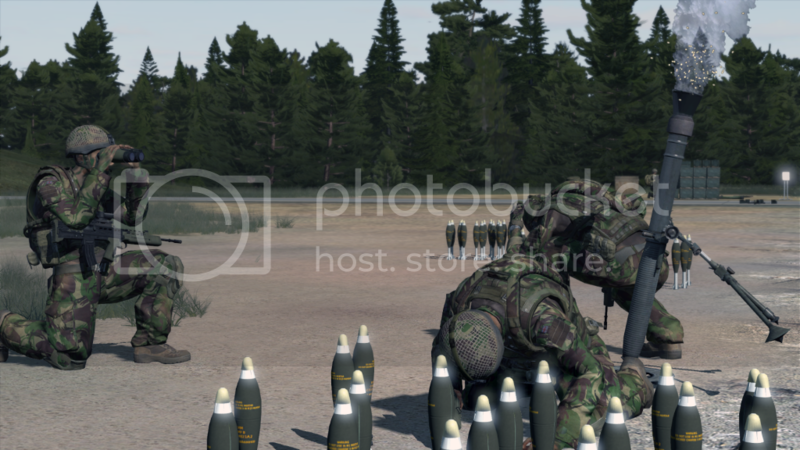 FSG once more, utilizing the 81mm at a training in the Bergen-Hohne MTA. A team versus team exercise. If you'd like to see more images, or better yet videos, please find our forum's gallery or visit our YouTube page, 16AAMilsim. 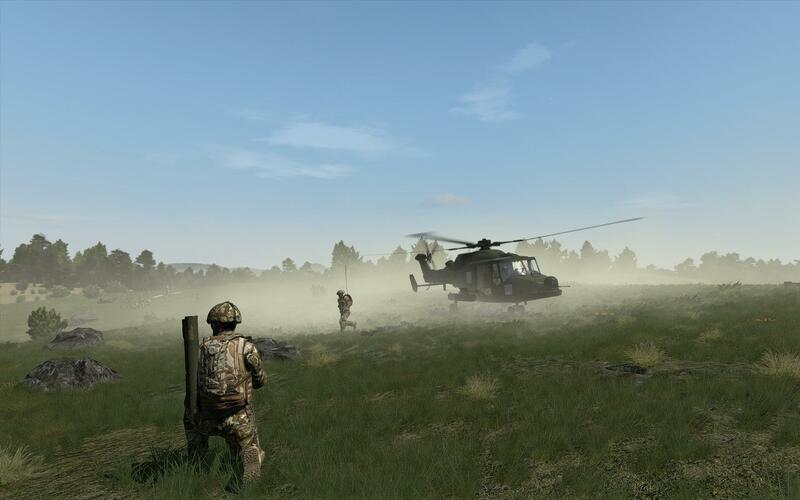 As a mature gaming community that has been going strong for a long while and with a large base of members, we in the 16AA sought simply to make the best approach towards British military simulation that the Arma series can offer us. This has proven to be a healthy approach. The 16AA still offers positions to those who wish to join. In this post I wish to show you some pictures of what we've been doing. There are some other posts here that detail what we have done in the past and how we are set up. In short, we focus on British military simulation, centered around the capacities of a real life airmobile unit. We have two platoons of infantry, a supporting flight element, a supporting weapons element, and a supporting medical element. 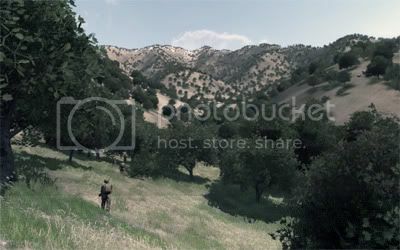 If you find you want more, head over to our Youtube page or go to the gallery on our forums. The 16AA alternates between home rotations, where we train our core skills, and operations, where we deploy on campaigns that last 1-2 months. 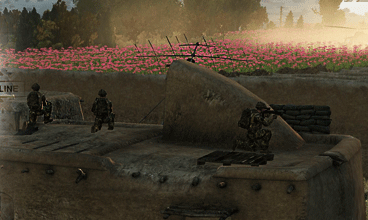 The 16AA has recently finished its Bellerophon campaign, learning a great lot about its potentials. 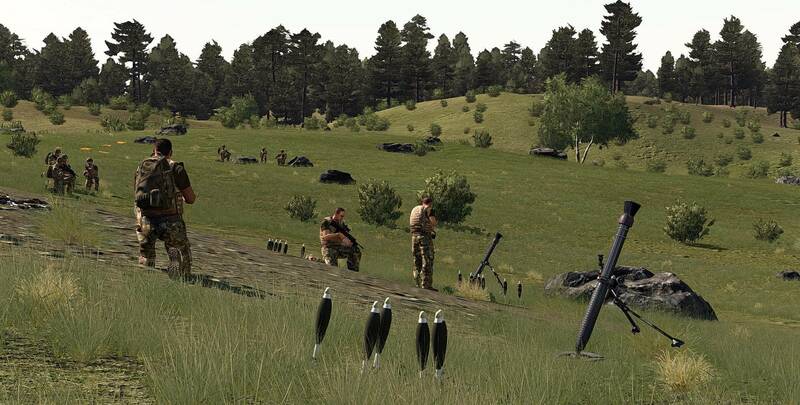 Our Fire Support Group (FSG) is currently expanding its battlefield repertoire with the 105mm Light Gun, offering the infantry artillery support. With its direct and indirect capacities, this part of the unit now commands the GPMG, Javelin, marksman rifle, 60- and 81mm mortars and the Light Gun, and operate the 40mm AGL, HMG and the Coy's MANPADs when necessary. A new JNCO cadre recently graduated in the 16AA. Following the most rigorous training that is available in the 16AA, these individuals go on to assume positions of great responsibility in the flight or infantry elements. The latter may become 1IC or 2IC of a section, placing an immense demand upon their tactical and inter-personal skills. How do you play on the strengths and different skillsets of the section's individuals, motivate them through failure and succeed together? Finally, the 16AA is not above some roleplay for the sake of variation. 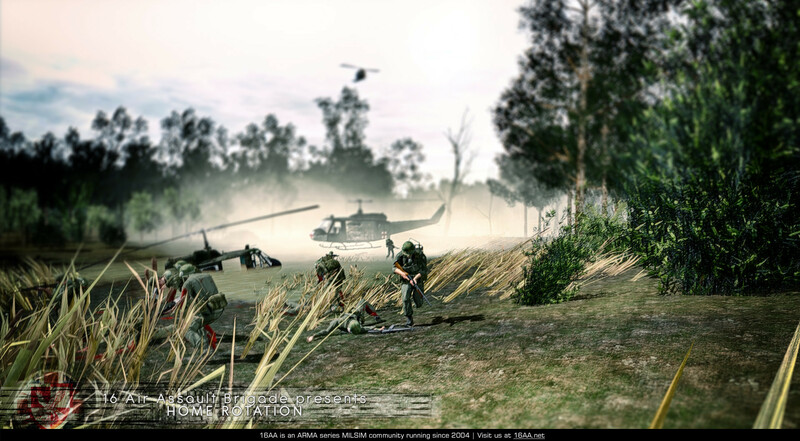 Utilizing the Unsung Mod, the 16AA deployed as Marines in Vietnam for one operation. The ACOGs gave way to iron sights, the Harriers gave way to Super Sabres, and laser-guided munitions gave way to some few instances of napalm. Because you can't shoot what you can't see. 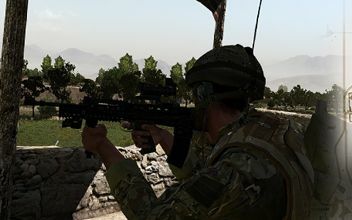 I hope your will check out our forum and possibly leave an application, should we suit your needs for a Milsim fix and should you meet our formal requirements. Our teamspeak is open for anyone inquiring about applying! This post to give an update on what the 16AA has been up to lately. In the time since the last update, we have deployed to Everon and conducted a home rotation. 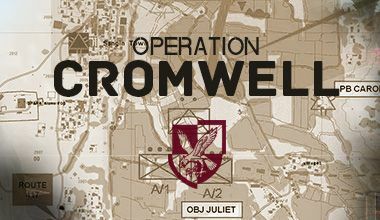 We are imminently stepping off to a new campaign of operations, the summary of which should follow in the next update. This update more picture-heavy than the last, and hopefully to your liking! 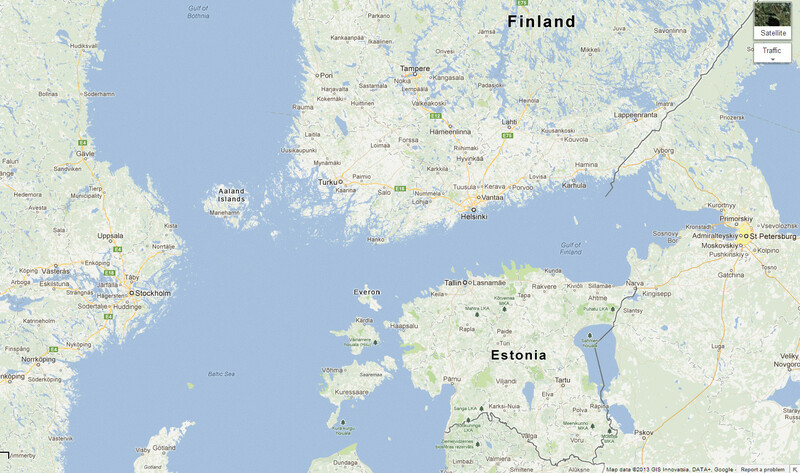 The 16AA has contributed as part of a NATO deployment to the Baltic island state of Everon, Operation Centurion. This deployment was prompted by evidence of atrocities perpetrated by Russian Peacekeeping forces who have been operating unilaterally in the region with a stated intent to prevent a return to the civil war which so badly damaged Everon and neighbouring states in the early 1990s. In an intense but limited conflict to eject Russian elements from Everon, the 16AA successfully deployed to force a stalemate and improve leverage in ensuing negotiations over the island's peacekeeping forces. Sour weather as three 656 Sqdn Apaches deploy in support of A Coy's defense against the initial Russian counteroffensive. Hastily prepared defenses wash away.. Improved conditions later in the week, permitting air assaults on the enemy's flank; the 16AA avoids head-on engagements where possible. 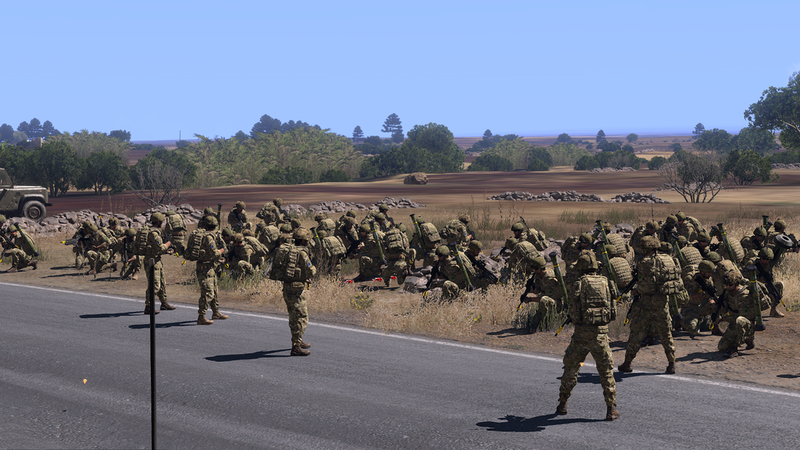 1 Platoon of A Company moving off towards a forming-up point ahead of an assault. Dawn breaks on a night-time assault. 3 Section of 1 Platoon at forward assault line near enemy entrenched position. Platoon movement is rehearsed on Copehill Down. 656 Sqdn Wildcats used to perform as the Coy's transport or CASEVAC platforms. Now the unit is far bigger and prefers Chinooks or Merlins for this task; the Wildcat most often relegated to performing ISTAR. Soldiers gather around for a training lesson during home rotation. 656 Squadron provides elements of A Coy with a display of their capabilities, capabilities possibly required on the upcoming Operation Forseti. Do you wish to join a UK milsim group? Another month has gone by in the 16AA and seen some radical changes. Most of these I will get to outline with the next update, as they concern our flight element gaining the Eurofighter Typhoon and Puma. Consequently there should be distinctly fewer Harriers and Gryphons in the air. 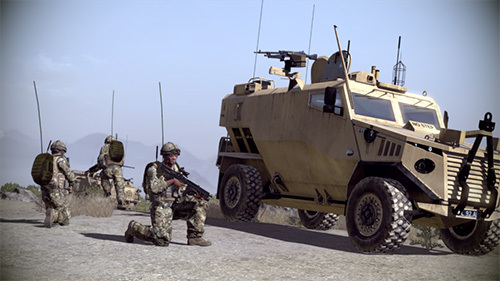 Additionally the Foxhound has been put into service, giving greater safety to land mobile troops. While the Jackal will still be in service, the Foxhound and Ridgeback together offer vastly improved mobility in areas with an IED threat, as was often encountered during our latest campaign, Operation Forseti. 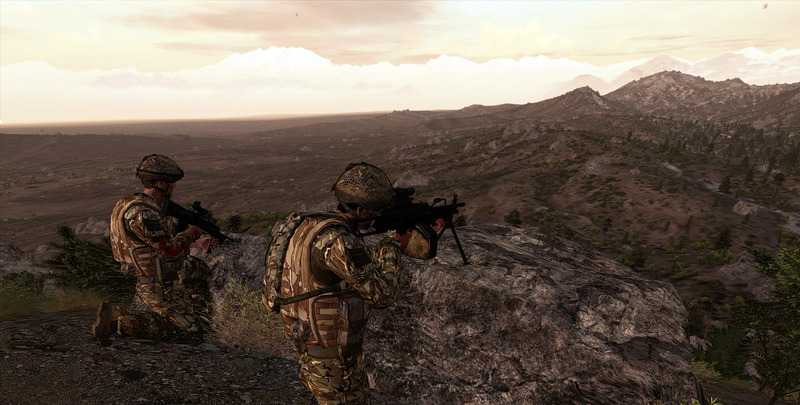 Operation Forseti was an ISAF endeavour to bring security back to the Takiban province of Aliabad and the Golam Valley. Prior to Op Forseti, after the handover of regional security from ISAF elements to the Takiban National Army, this region saw a rise in violence and attacks on TNA security forces. UK forces, represented by the 16AA Brigade, elements of 1 Flight RAF and elements of 7th Royal Horse Artillery, were tasked to restore order to the valley. These elements have worked hard to solve the tasking, combining section patrols with full maneuvers and company-sized assaults. The campaign has seen particular threat from IEDs, demanding a solid grasp on counter-IED drills. Restraining ROEs were naturally in place to prevent the use of force where this endangered the civilian populace. 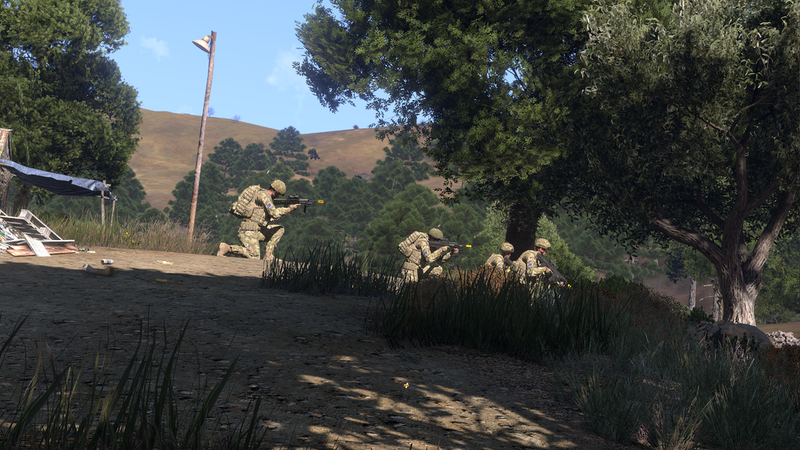 For this update, we've chosen to highlight our Fire Support Group (FSG). There is a direct and an indirect arm of this unit. The direct element is a group under A Company HQ's command, which can be used to put pressure on particularly hard to reach places. As these operate the Javelin for Anti-Tank duties, they are able to more effectively deal with armoured vehicles or fortified positions, at a greater range than the individual infantry sections are able to. With the L7A2 GPMG, they can also suppress larger areas at a longer range, allowing the sections to move up into effective range of the enemy -- or conversely to maneuver behind smoke screens. Often motorized and routinely called upon, FSG is always vital if we're to get the job done! Joining FSG happens after spending at least one month on the ground in a traditional infantry section. This ensures that you both learn what and who you will be supporting, and allows us to compare you to others that are trying for the same slot. Those who can refer to excellent attendance, professionalism and responsibility will naturally be considered first. If you wish to join the 16AA to take an FSG role, you should head over to our website and when applying mark down your interest for FSG in the relevant field of the application. For now, some pictures and videos from Operation Forseti, number 1 through 4. More on the indirect arm of FSG in the next update. We have more Youtube videos at our page, or you can go to our galleries. You can always hop on our Teamspeak at ts.16aa.net, port 9987 for a chat if you are unsure about whether the 16AA might be something for you. 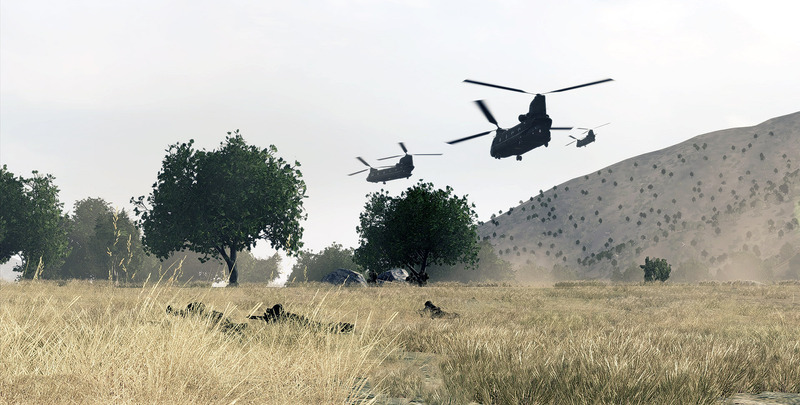 The 16 Air Assault Brigade has recently returned from its deployment in Nuristan on Operation Europa. Operation Europa was a deployment in support of the infant Islamic Republic of Nuristan, a region along the Pakistani border with a well-developed nationhood. Despite the regime's relative stability compared to its neighbours, ethnic tensions in 2013 contributed to a deteriorating security situation. An insurgency flared across the country, with the main threat to the regime capital coming from the Talkalakh region in southeastern Nuristan where a division from the Nuristani National Army joined the rebellion. 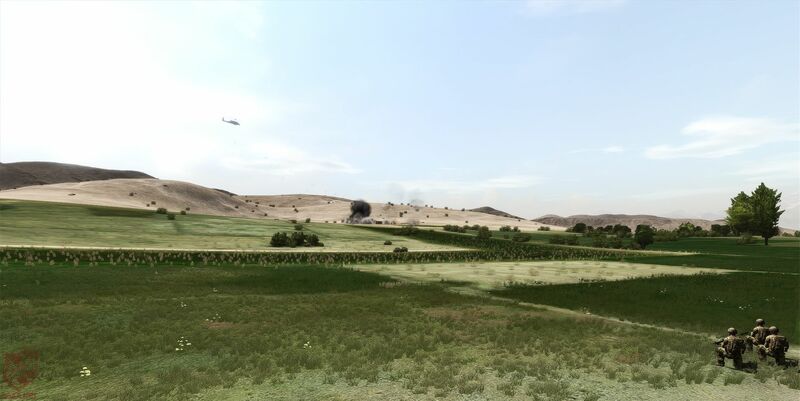 The 16AA was called on to assist the NNA in its efforts to halt and defeat the rebel division, and was able to launch an air assault on one its airfields. In the following weeks, aggressive movement by the 16AA effectively opened a second flank and disrupted the enemy until a ceasefire with a demilitarized zone was put into place. 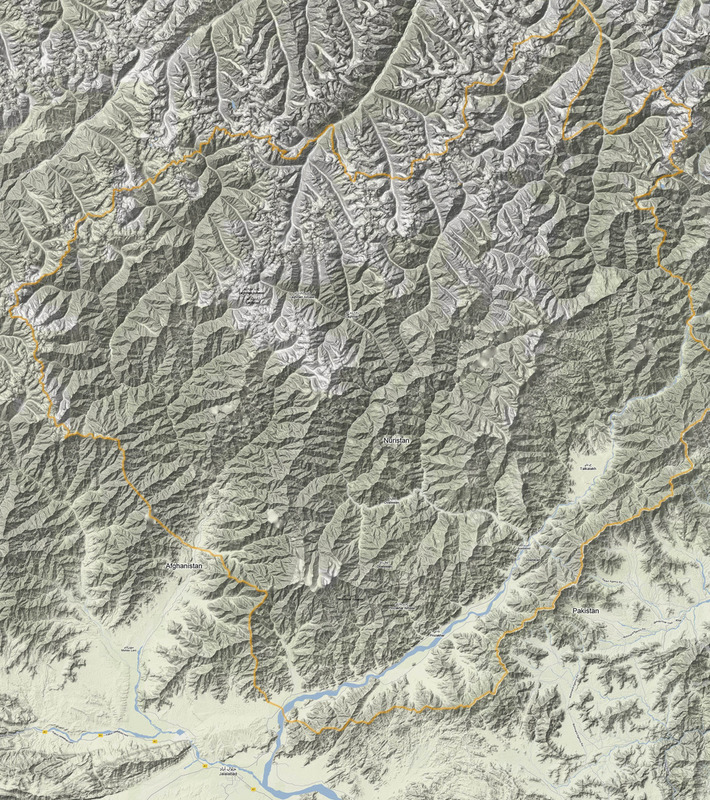 Skirmishes across the DMZ eventually escalated into a full-fledged counter offensive by the rebel division, but this movement was effectively halted by Nuristani and British forces. The 16AA was rotated out of the theatre to be replaced by the Rifles, in time to possibly see use in an even greater conflict. Following returned instability to the region, 16 Air Assault Brigade is once again deployed to the Sangin Valley in Helmand Province, Takistan. In a follow-up to the ISAF-led operation Paramo, A Coy 16AA Bde has been tasked within bringing back safety and stability to a region that since being handed over to local TNA and TMP forces in the area has seen many reports of heavy handedness and corruption. An insurgency, once pushed back outside of the crucial safety umbrella around Sangin, has now slowly gained a foothold in the surrounding valley and has been reaching out to corrupt TNA officials to turn a blind eye to large scale opium and cannabis production in the region. The 16AA was called back to Takistan to once again re-occupy and hold vital patrol bases and forward operating bases and to mount patrols around the fields to the east of Sangin valley and the town of Sangin itself to the east. Small-scale skirmishes broke out in many of the more remote patrol bases, following an agitated Takibani retaliation as control for many of their lucrative supply routes through the 'Roman Road' (the main, service road travelling from west to east) and 'Route X-ray' (another MSR running from north to south) was cut by the aggressive patrolling of A Coy. 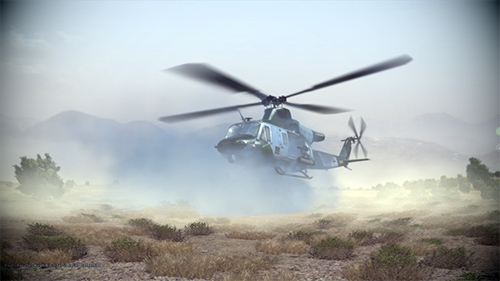 At its crescendo, 16 Air Assault found themselves chasing a known collaborator, Lt Col Bakht Rawan Toryal, through the Marzarak Pass area and with the assistance of US special forces intel, were able to capture and hold a large narcotics factory complex and eliminate Toryal. With their supply route cut, and their processing facilities siezed, the local Takibani insurgency had no choice but to retreat into the relative safety of the surrounding mountains - again retaining the security umbrella around Sangin. The tragic civil war in Syria and the rise of the terrorist group 'Divine State' from the ashes of conflict and sectarianism in Syria and Iraq have created untold human suffering. Refugees fleeing the conflict represent the largest movement of population since the second world war. As politicians in Europe and the United States debate the merits of a sustained air campaign against Divine State, direct military intervention by Russia to prop up the beleaguered Syrian State shocks the world. The Russian build up is rapid and well planned, with elite ground troops securing airbases at LATAKIA and KHMEIMIM. Significant redeployments of Russian Navy assets are also underway in order to secure vital supply lines to those locations. 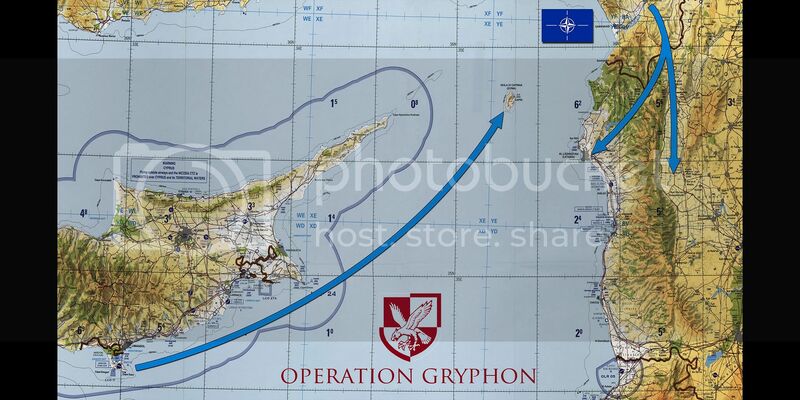 Fearful of Russiaâ€™s intentions in the region Parliament orders limited mobilisation of the newly formed Rapid Reaction Brigade to the eastern islands of the Greek Archipelago in the Aegean Sea. 2 PARA have been deployed as part of NATO TASKFORCE AEGIS and are based at NATO facilities on KRATIKOS AIRFIELD. A significant section of north-west LIMNOS has been designated as a Military Training Area in order to enable live-fire training for elements of the UK Taskforce. A Company begins training to prepare for possible hostilities in the Aegean. Infantry skills are brushed up and rapid fighting withdrawal tactics are practiced. A Company forms up ready for Exercise Fortress. The buddy team fire and maneuver range is put to extensive use. 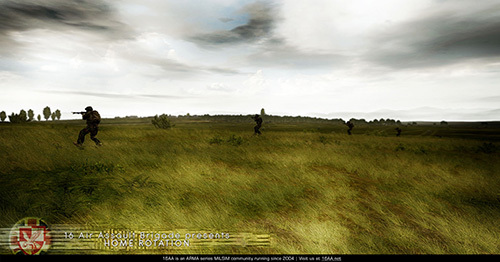 An infantry section prepares to go through the Section Attack range. All is calm but the tension in the region is building. Come and join us for one of the best Milsim experiences around.